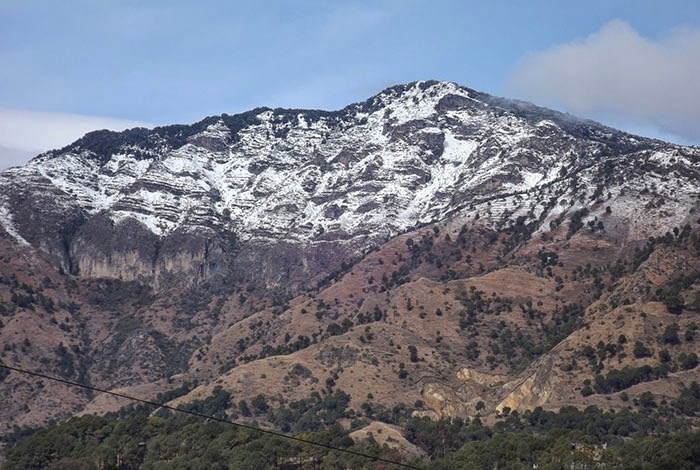 While traveling through road on Kalka-Shimla NH 22 highway, you will get to see a highest peak at 7,000 ft near Solan. The peak is commonly known as Karol Ka Tibba in local language. There is a unique and breathtaking trek to this place. Tibba in English means the topmost point of a mountain. Karol Tibba and Meteol Tibba are located next to each other. Local people in Solan believe Karol to be the most prominent place in the whole city to visit. Every year, there are a huge number of trek addicts and nature lovers who come to explore this incredible mountain. A few medicinal herbs including Sanjivni Buti are also believed to be found on Karol mountain. History of Karol: The tibba is famous for its ancient Pandava times stories. A mysterious Pandava cave, the destination of the trek, is hard to reach. Some trekkers took 3-4 attempts to reach this magical cave because of the dense forests in between. It is believed that this cave exists from the time of Mahabharata, the Indian epic. The cave is believed to be the longest and deepest cave in the whole Himalayas. Its one end is in Karol and other closing end is in Pinjore, 47 Km away from Solan. Some scientists carried out an experiment in which they poured some colored water at the Karol opening and found the water rushing out in pinjore through other end. This confirmed the length of the cave. It is believed that the cave has some magical powers and one has to remove all the leather items from body before entering the cave. Journey starts: 6 Kms from Solan on NH 22 comes a village called Chambaghati. You can reach Chambaghati by bus or auto from Solan. There is a narrow lane in between some shops that goes uphill towards Karol. This is the starting point of the trek. Me and my two other friends started our trek from there right at 11 am. On that day, we were alone who were trekking to that mountain. We started climbing the steep mountain with our SLR camera to take pictures of the scenic beauty. Within first half an hour we were so tired that we were unable to feel our legs. Up the hill, there comes Jarash village after a trek of about 2 hours, last village of that mountain. The Karol tibba was full of oak trees. After a one and a half hour trek, we entered the dense forests of Karol. Locals told us about the existence of mountain lions and stripped hyenas in the forests but to our luck those animals haven’t attacked any human till date. Within few minutes of entering the dense oak forest, we lost out track like everyone does here. We were horrified because of the hallucinations we felt thinking of the wild animals. One of my friends even heard the roars of tigers there. We used our mind to its fullest to get back on the track again. I must prefer that you should not go there with any minors as you may have to face some big problems while crossing the jungle. We were really tired of the trek and still we have to trek for 1 more hour. Our water bottles were emptied but somehow we manage to gather some water from caretaker of that ancient temple there. There were just 2 people in there who took care of temple’s well-being. We asked him the way to another temple which was adjoined with the Pandava cave(our destination). We walked down the jungle for another half hour to reach Pandava cave and the ancient mandir. Reaching the cave was itself out of the world experience. Temple’s caretakers told us to remove our shoes and leather items from our body before entering the cave because of its religious entity. We tried entering the cave but unable to go more than 20-25 feet inside as it was dead dark inside. Some big bats flew towards us right from the inside of cave and we ran out of there totally frightened. Some people say that the cave is magical and if someone after consuming alcohol or non-vegetarian stuff tries to enter the cave then he/she will surely disappear inside. We filled our bottles with the chilled and clear water and asked the caretakers to guide us the way through jungle. They gave us a few hints for finding the way. For your information, I want to say that the place is literally a labyrinth. One should take help from the locals otherwise you will surely mislead your way inside the jungle. Also, you must have to reach the city before darkness because it is impossible to stay up there at night due to presence of wildlife over there. Trek Ends: On our way down the forests, we found some traces of some wild animals faeces. We were totally horrified again. Somehow, we managed to find the correct way through jungles and by 5 pm we reached the Jarash village. Then we had a sigh of relief. We took some pictures of the astounding beauty of mountain belt. We reached Chambaghati by 6 then boarded a bus directly to Chandigarh for our way back to home. The Karol trek will always be in my memories and I wish to conquer this mountain once again in my life. Well, I had a similar trek to Karol Tibba when I was getting back from Sadhupul. Time I started was 3 PM, and believe me, I was all alone. Though there was little light while climbing up, but when I was getting back, it was total dark. Only thing I had was a bamboo stick, which care taker gave me at temple. I kept beating the stick with rocks on the way, just to let Tigers know that I am around. They usually avoid if they know you are around, and attack if you come in front of them from nowhere. Hey Mekey. Just read your story. Your experience was more thrilling than ours. I just revisited the cave a month back. I m planning to go alone this weekend.You mentioned about animals.Is it safe to go alone.